Booking Now: Knockmealdown Active is holding five day walk of St. Declan’s Way over 5 months in 2019 (visit the new St. Declan’s Way Website while you’re at it). A leg of the journey will be undertaken on the final Saturday of each month from April to August (April 27th, May 25th, June 29th, July 27th & August 31st). Each leg of the journey is about 20km. Check out the information page here. If you just want to go straight ahead and book you can do so at St. Declan’s Way 2019 Booking. On September 7th 2019 the annual Knock ME Down Challenge and Knock ME Down MÓR events will be held in Newcastle. This year’s event will be bigger and better than ever. On the final Saturday in September there will also be a ‘Celtic Camino’ Walk along a portion of St. Declan’s Way (from Lismore to Ardfinnan). This walk will cover the 25km necessary to apply for a Celtic Camino. By walking the 75km route from a Coruña (or la Coruna) on what is termed the ‘Camino Ingles’ to Santiago you can then qualify for a ‘Compostella’ (certificate of completion). The Knock ME Down Challenge and Knock ME Down MOR events are now booked out – there are a limited number of replacement places remaining. To be informed when events are launched either sign up for our newsletter on the popup or Like and Share our Facebook Page and we’ll let you know. For a full overview of the event click on the graphic above or visit – https://bit.ly/2zkIbXi. In summer 2018 the inaugural ‘Rhododendron Walking Festival‘ takes place along the tracks and trails of the Knockmealdown Mountains and surrounds. All events will take place while Rhododendron plants should be in full bloom, on the June Bank Holiday weekend running through Friday 1st, Saturday 2nd, Sunday 3rd and on to Monday 4th – visit ‘Rhododendron Walking Festival 2018 Events‘ for further information and online booking. There are FREE events (Friday evening’s Heritage Walk and a Family Fun Day at Kildanogue Duck Ponds on Monday morning). There are also events for walkers of all abilities (Saturday’s Knockmealdown Way has 34km, 18km & 9km options and Sunday offers 3 hour or 1.5 hour Rhododendron Loop Walk options). The festival is very much family oriented, with Family Friendly walks on Sunday (1.5 hour Rhododendron Loop Walk) and Monday (Kildanogue Duck Ponds Family Fun Day). Friday’s and Sunday’s events also include music from the Retrophonics and the Fogues. You can keep up to date with the Rhododendron Walking Festival at its Facebook Page – Facebook.com/VeeWalks, or via Twitter at Twitter.com/VeeWalks. Note: the May 26th walk from Goatenbridge to Lismore is now totally booked out and a list of 20 replacement places has also sold out. There is a limited supply of places in the June and July events, although these are selling out quickly. To celebrate the official reopening of the full 104km St. Declan’s Way route, Knockmealdown Active is organising a five stage guided walk of the full route. The quintet of walks starts on Saturday, March 31st. To facilitate those wishing to take part, the walk will not be over consecutive days but in 5 Stages on the last Saturday of March, April, May, June and July. For most people this will means no time off work for a historic chance to be part of the first group to fully walk this restored route. Christmas walk on Wednesday December 27th along a section of St Declan’s Way from where it crosses the the Dungarvan to Cork Road (N25) at Grange to Knocknaskagh beside Ballinameela church. The 2017 event is now fully booked. If you would like to be notified for next year’s event please leave your email address on the PopUp subscription form and you’ll receive an email when the event starts booking. A total of 3 walks being taken in aid of Parkinson’s Sufferers. Walk A (Ballyporeen to Newcastle) is 32km, Walk B (Clogheen to Newcastle) is 15km and Walk C (Goatenbridge to Newcastle) is 8km. All cost €20 per person to participate. Sponsorship cards are available at shops and businesses around South Tipperary. For further details on the walk visit the information page here. If you know what it entails you can go straight to the booking page using the link below. To sign up for updates when new events are announced add your email address the Pop-Up that appears on this page or Like & Share our Facebook Page. As part of the Pilgrim Paths Week 2017 celebrations in April, Knockmealdown Active will organise a walk from Mount Melleray in Waterford, over the mountain to Ardfinnan in Tipperary. There will be two options for walkers, a led-walk and a self-navigate option for the more adventurous. Walkers will gather at the Green in Ardfinnan at 9.00 on Saturday, April 15th 2017. The walk will begin at 11am from Mount Melleray. Full details of the walk are available at this link, the event has obviously now completed. Our final Canoe-B-Q event of the season was held on Sunday September 25th. You’ll find photos of the event on our Facebook Page. 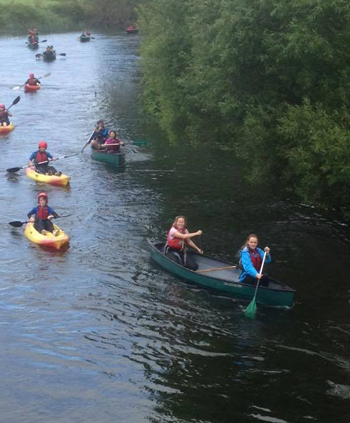 The September 25th Canoe-B-Q (Canadian Canoe or Kayak trip down the beautiful River Suir from Cahir to Ardfinnan with a tasty BBQ at the finish) was fully booked. If you wish to be informed when events are announced just Like and Share our Facebook Page or fill in the Subscription Pop Up on this page and you’ll receive an email for all our upcoming events as they come online. The fully booked Saturday September 10th cycle, run/walk and Kayak event around beautiful south Tipperarywas a huge success. You’ll find plenty of photos and video of the event on our Facebook Page. If you would like to be informed of future events please sign up on the subscription Pop Up and we’ll add you to our email database. If you would like to keep informed of upcoming events please sign up on the subscription Pop Up before you exit the site or you can catch up with us on Facebook. KnockmealdownActive.com Canoe-B-Q (Canadian Canoe or Kayak trip down the beautiful River Suir from Cahir to Ardfinnan with a tasty BBQ at the finish). The Sunday July 31st event was a fully booked and a very fun event, photos now available on our Facebook Page.